Single Ma started it and FB continued it--here's my financial health grade. Points were taken off for housing, life insurance, and retirement savings. The life insurance one is totally bogus--I have no debt, no dependents, and plenty of cash on hand for burial costs. My company provides 2x my salary for free, which my sister is the beneficiary of (don't kill me, sissy! ), which is, frankly, MORE than enough for my situation right now. High housing costs are a legitimate worry, however. My rent is more than 50% of my take-home pay, and that hurts. When Peanut and I move in together this summer, however, I'll be well below the suggested 28%, so that's only...jeez, two more months of paying rent on my own. Wow! I don't have enough in retirement, and I'm not saving enough monthly/yearly for retirement, either. When Peanut moves in, I will beef up my retirement savings by a lot (I'll start saving to max out a Roth IRA which is ~$400 per month--I already contribute the max that my employer will match to my 401(k)). I think I might need to revisit my budget to have a slightly better idea how to save enough. Also, this little widget asked what my monthly debt payments are, but that's misleading in my case. I'm still in school so my student loans are deferred, and I don't know how to figure out what they'll be when I start paying them back. But in about a year, I'm going to have about $30,000 of student loan debt that I don't currently have to worry about. I also realized that even if I don't get a raise this year (I'm really not sure how likely it is at all; right now, I'm glad just to have a job), come January it will SEEM like I got a raise because I'll drop my flex spending money down to $1000 or less, giving me an additional $350 pre-tax per month. That money could go directly into retirement without my noticing, probably. 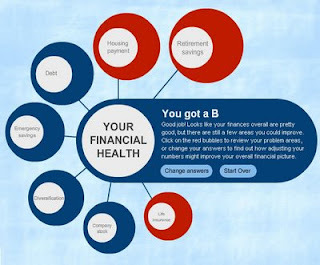 If you want to see what your financial health grade is, go here.